Woodpeckers is a contemporary boutique style detached cottage with a spacious, light, open plan living area, luxurious bathroom and a beautiful bedroom. You’ll find handmade British soft furnishings with decorations in Farrow and Ball colours and granite worktops to the well-fitted kitchen. The comfy sitting area has a Smart TV with free view, DVD player and WiFi. There is central heating throughout. 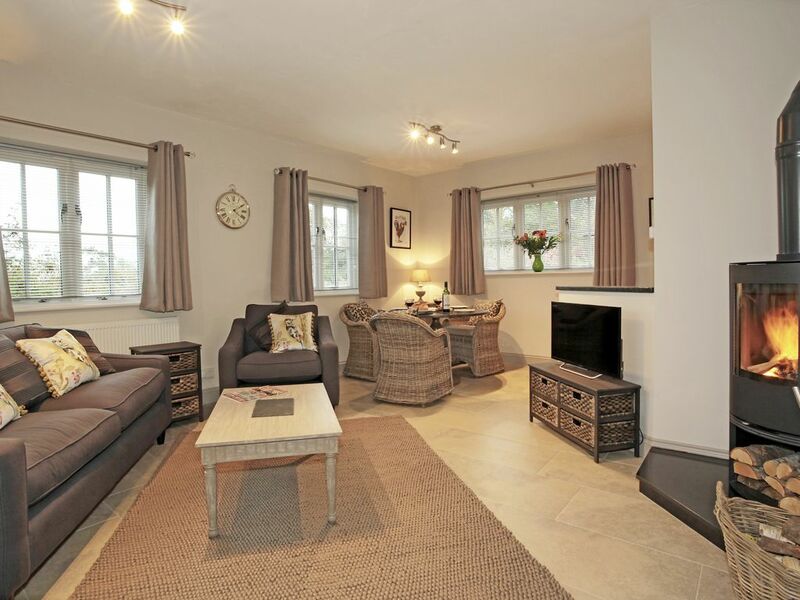 The accommodation is designed to an exceptionally high standard in a rural, tranquil setting. Fresh flowers and a welcome basket of basic supplies greet you upon arrival together with a complimentary bottle of wine. The entrance door leads from a porch into an open plan sitting/dining room featuring a contemporary wood burning stove made up with logs ready to light, ensuring you are cosy throughout your stay during cooler days! The fully equipped, open plan kitchen leads off the dining area, it has a Neff electric oven, induction hob, Bosch microwave, fridge with ice box and dishwasher. The utility cupboard has a washer/dryer, iron and ironing board. The bedroom features a luxurious king size bed with quality linen. This leads to a large en suite bathroom with walk in shower having two-shower head options, large double-ended bath and plenty of storage within the hand made vanity unit, a heated towel rail with Egyptian cotton towels and welcome toiletries. Woodpeckers enjoys its own landscaped courtyard garden with outdoor furniture and gas BBQ (during the warmer weather). There are country walks from the door onto a bridleway and the nearby Ashdown Forest (2,396 hectares). This cottage is in the gardens of an old coach house, which once formed part of a larger estate; therefore it has the benefit of a shared private tennis court and small fitness room. Guests are welcome to use these at their own risk. For further information please contact the owner direct. Whilst we love dogs, we do not have pets to stay. Nor do we have smoking anywhere within the cottage. There is a detached two bedroom cottage close by, ideal for family groups and friends wanting independent accommodation. See Deerkeepers Cottage. I was bought up on a farm so enjoy all aspects of rural life. I originally had a career in London, but when I was expecting our first child wanted to move back to the countryside to give the family the space and freedom of rural life. I also enjoy hacking around the Forest on my dear old horse, Fred! The nearby Ashdown Forest abounds with wildlife and yet it is still very accessible to towns such as Brighton, Tunbridge Wells and nearby Three Bridges station for a fast train journey to London! The more leisurely travellers could take a train from East Grinstead to London or better still a steam train to Sheffield Park! On a clear day there are views of the South Downs from the property and upon exiting the drive you will see the North Downs. The 6000 acres of Ashdown Forest is stunning, there are so many lovely walks, bird watching hides, areas for cycling. There are also many gorgeous historical gardens and National Trust houses within easy reach. Luxurious spacious bathroom with very large thermostatic shower with a choice of shower heads, one being a drencher. Large marble topped vanity. Large double ended bath. w.c.
Quiet walks from the cottage door step onto footpath to private woodland. (There are stiles and hills) or walks onto quiet country lanes. Lots of carparks all over the 6500 acre Ashdown forest. East Grinstead with Sainsburys and Waitrose supermarkets. Main railway to London or steam train into countryside!! Forest Row approx. 2 or 3 miles. Vibrant village with independent shops and cafes. The hop barn has craft beers and pizza! No telephone, so bring a mobile! Wood burning stove made up ready to light. Logs in store very nearby. All dishes, bowls, cutlery and cooking utensils included. Bottle opener, garlic press, mixing bowl, scales and most bits and bobs for cooking! Fully fitted with built under single oven, induction hob, fridge with ice box, slimline dishwasher and microwave. There of plenty of cooking utensils, pans, oven to tableware, china and cutlery. There are a few books in the cottage. There is an Anka to connect your smart phone or tablet so you may listen to your own music. The Smart tv has the radio stations! Shared tennis court approx. 50 metres distant. Rackets/ balls in Fitness room but bring suitable footwear please. There is one 15cm step up to entrance door, then a threshold. Once inside all on one level. The property is immaculately clean with all the necessary amenities. The surrounding area is perfect for walking . Can't wait to come back again some time in the near future. Thank you for your touching review, it was an absolute pleasure having you to stay and I am delighted you had such a relaxing weekend. I look forward to welcoming you again sometime in the future. A really luxurious and fabulous place to stay. We were blown away by the quality of everything in this cottage. It was furnished to an extremely high standard and was comfortable and very stylish. Everything from the furniture itself to the wood burner right and down to the little details such as the luxurious throws and scatter cushions. The kitchen was also amazing with fabulous high quality pans....and everything you could possibly want or need for a perfect self catering stay. We loved the separate bath and shower with plenty of hot water and the comfy bed and crisp white bed linen. We slept really well as it was so quiet. Angie provided a welcome pack which included the essentials (milk, bread eggs etc) but also a bit of added luxury with ground coffee, a bottle of wine and home made cakes. Wonderful and very thoughtful. Although the cottage was close to the main house it was still very secluded with two paved sitting out areas. There were lovely walks straight from the door, a great tennis court and well equipped fitness room. We couldn’t believe it when we saw the shelf with wellies lined up in all sizes available for guests to borrow. So typical of the very thoughtful host. Overall we couldn’t fault the cottage and its surroundings. It was simply amazing and we felt very spoilt. We can’t wait to return. Thank you Angie. I was very touched to read your wonderful review, it was an absolute pleasure having you as guests. Thank you so much for appreciating the cottage and I very much hope to welcome you again. Great place for our short break: warm, comfortable, had everything that we needed. The "welcome pack" (including wine!) was a lovely touch that we've not come across anywhere else we've rented. Thank you for your kind review of Woodpeckers and I hope to welcome you again. Thank you for your kind review and we are pleased you enjoyed your stay. We also love the walks as they are very natural and unspoilt, the Ashdown Forest is a real bonus. Lovely cottage photos do not do it justice. For me it was the ideal home from home whilst working away and the groceries were great. Must be more fantastic if you are on holiday as nice luxury for a couple. Thank you for your lovely review and choosing to stay at Woodpeckers whilst working in the area. It was a pleasure having you as a guest and I am delighted you felt at home. Third time at this property, and everytime it feels like the first. Thank you for choosing to stay at Woodpeckers again and it is always a pleasure to have you both. A very happy, healthy and prosperous new year. We have beautiful walks straight from the door to private woodland, Ashdown Forest and country lanes. We provide guests with wellington boots (sizes 3 to 11). Tennis rackets and balls also available for guests use on the private shared tennis court within a few minutes walk from the cottage. The nearby fitness room has a running machine, spin bike and cross trainer. There are other miscellaneous items, e.g. weights, skipping rope etc.